From the Geocities home page “LadyMouse’s Queendom” I found several banners linking to SiteFights. It is an innocent web linking project where users create home pages and include links to SiteFighters. Then surfers can vote for their favorite page. The creators of the home pages are organizing themselves in teams and try to win the most votes together, in the meantime the team captain explains HTML basics and they share tips on how to make their creations become more popular. Apparently it was also possible to grow Christmas trees and adopt holiday dragons on one’s home page, by placing certain links back to the SiteFights server and to get different statuses, from “fighter” to “fighter/fairy” to DFairy of DRealm of the Fairies. It is really recommended to read the rules and guidelines on the still operational site. Especially the press section is nicely designed. 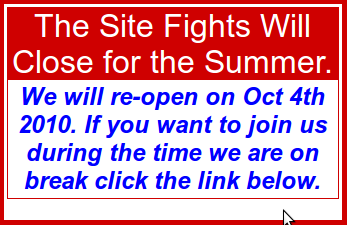 SiteFights promised a comeback that apparently never happened. The “Spiritbooks” (aka Guestbooks) are full of speculations why it happened. The last real date when it was updated seems to be some time in 2005 – well, starting in 1996 that makes 9 years, not bad for a completely non-commercial, community run effort. The most interesting part about it seems to be that many things were made manually. When a site was submitted to the competition, a “web patrol” would check if it contained the links required by the rules. They would give report if the submission was accepted “the next Monday” … after a weekend full of web surfing fun!